I’ve gotten to the point in life that when asked, “What do you want for your birthday,” I usually respond, ” Nothing.” I know this is a frustration to my wife and kids, but stuff is not as important to me, now. So, when my wife asked me THE question on Wednesday in anticipation of my birthday today, I got on Amazon.com and ordered a few camera accessories that should arrive in time for my birthday…not spending much because I’m not sure how much more I want to tie up in my current camera. My birthday was shaping up to be a low-key affair with some lunch and supper plans with a few friends, my wife and mother. However, as we know, plans can change in a second. Late last night, we got a text from our middle daughter, Katie, letting us know that she was having some issues with her pregnancy and that she was going to the hospital. Only about seven months along, her water had broken. The news of her pregnancy originally came to us as she traveled back to Texas after having spent Christmas with us. She had not felt well the entire holiday, so she bought a pregnancy test in Kansas. It was positive. However, her feelings about the pregnancy were never really positive. After delivering her first child last September, this was an “unexpected” pregnancy. But beyond that, something didn’t feel right. So, when at ten weeks the sonogram technician exited the exam room, saying she needed to get the doctor, my daughter’s feelings were confirmed. She was told that there appeared to be only fluid where the brain should be. While it was too early to conclusively diagnose, the couple was told that it was either anencephaly (absence of all or major part of the brain) or acrania (partial or total absence of the skull). The Spirit has only revealed to me to pray for Life… which could mean spiritual life for my non-Christian friend, life for another child from my baby’s organs, or life for my child. As the months passed, a clearer diagnosis emerged; acrania, the skull was not forming, a condition that results in death at birth or soon afterwards. They also discovered the child was a boy, our first grandson. An appointment soon followed with a transplant specialist to consider options and discovered the point of viability for transplantation. The baby’s weight would need to be five pounds, so a C-section would be scheduled close to full term. Of course, my wife and I would plan to be there for the birth to have whatever time God might give us with our first grandson. Those plans, however, all changed with the developments of last night. At 11:40 p.m., we received news that an emergency C-section would occur in the next few hours, giving us no opportunity to be with the kids at this critical time. Due to the premature delivery, transplants would not be possible, either. As the midnight hour passed, it dawned on me that my first grandson was going to be born on my birthday. Although I would not see him this side of eternity, he would always be my “birthday buddy.” He would be my birthday present on reserve, a treasure in heaven I will one day behold AND hold, healed and whole. Through a series of texts, I can only approximate that Silas was born between 2:00 a.m. and 3:30 a.m. He lived for about six minutes. Though we will grieve his short earthly life, we have hope that through Jesus Christ, Who is the way, the truth and the LIFE (John 14:6), Silas was welcomed into eternal joy and glory early this morning. I’ll see you later, Silas! I look forward to unwrapping all that there will be to know of you and your experiences in the unfettered presence of the Lord! I just wanted to say how unbelievably thankful I am for the prayers, thoughts, love, flowers, meals, and support my family has received over the past several days (and months)! I am honored to have given Silas Lee 29 weeks of life in my womb and 6 minutes outside of it. His short, sweet life has forever changed Daren and me; we are eternally grateful for our son. Although the heartbreak is very real, God’s peace and absolute goodness through the months of suffering has been, oh how, indescribable. Thank you again for all the love…we feel it! ADDENDUM (June 6, 2017): Three years after the birth and death of Silas, he is still missed and thought of with regularity. A caring church member gave me a memento that she had received for making a donation to the Children’s Miracle Network Hospitals. 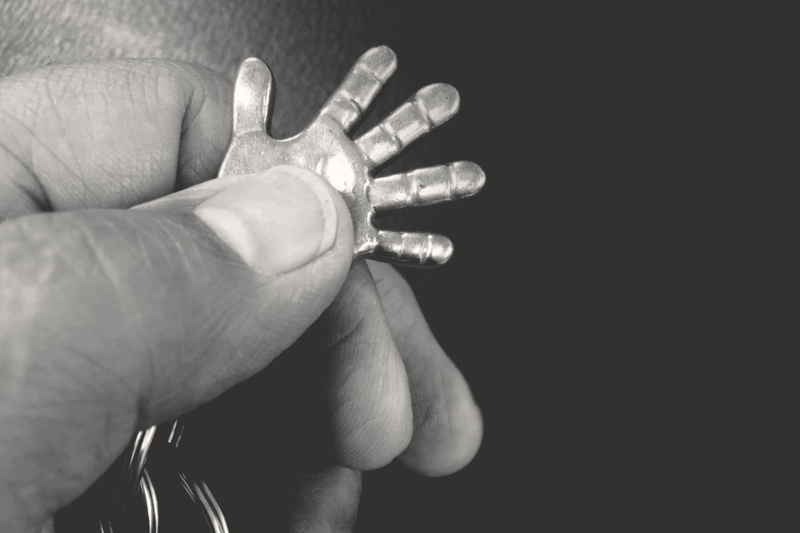 The tiny pewter key ring fob depicts the hand of a one pound, six ounce baby who survived a premature birth through the advances in neonatal care. In my case, the hand serves as a touch point that I continue to have with Silas, whose hand was about the same size at birth.